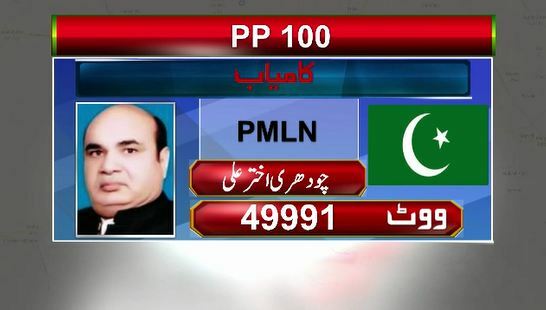 GUJRANWALA (92 News) – Pakistan Muslim League-Nawaz (PML-N) candidate Rana Akhtar Ali has defeated Pakistan Tehreek-e-Insaf (PTI) candidate Ehsanullah Virk by over 21,000 votes in PP-100 by-elections on Sunday. The voting for Gujranwala PP-100 continued from 8am to 5pm without break. Torrential rains marred the polling process with polling starting in several stations after a delay of half hour to an hour, while polling staff could not reach on time at several polling stations. As many as 113 polling stations have been set up for 162,444 registered voters. The by-election was held on Punjab Assembly seat after assassination of Rana Shamshad Ali. 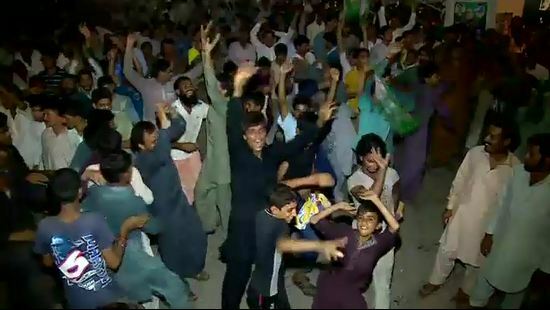 According to unofficial results, PML-N has won its seat again in the by-election. Rana Akhtar Ali bagged 49,991 votes while his opponent, the PTI candidate, Ehsanullah Virk could secure only 28,380 votes. The PML-N activists gathered at the residence of Rana Akhtar Ali and danced on drum beats.